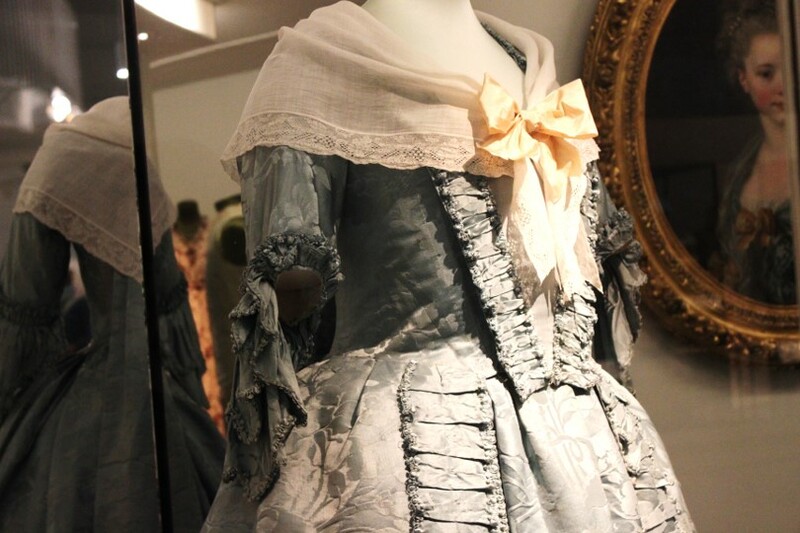 These gowns were called robes – after the French word for dress, as France was the center of fashion in these days. Usually, the robe had a skirt that opened in front to show the petticoat worn beneath. Often the bodice of the gown was open in front, too. The opening was filled in with a decorative stomacher. It was simply pinned to the gown or to the stays beneath. The so called ‘pagoda’ sleeves of the robe went just past the elbow. 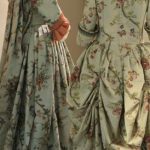 They were trimmed with frills or ruffles, and separate under-ruffles. Both were made of lace or fine linen, and they were simply tacked to the inside of the gown’s sleeves. The method of simply pinning or tacking parts of a dress allowed for a kind of ‘mix-and-match’, giving a robe a new look with a different stomacher or with different ruffles. 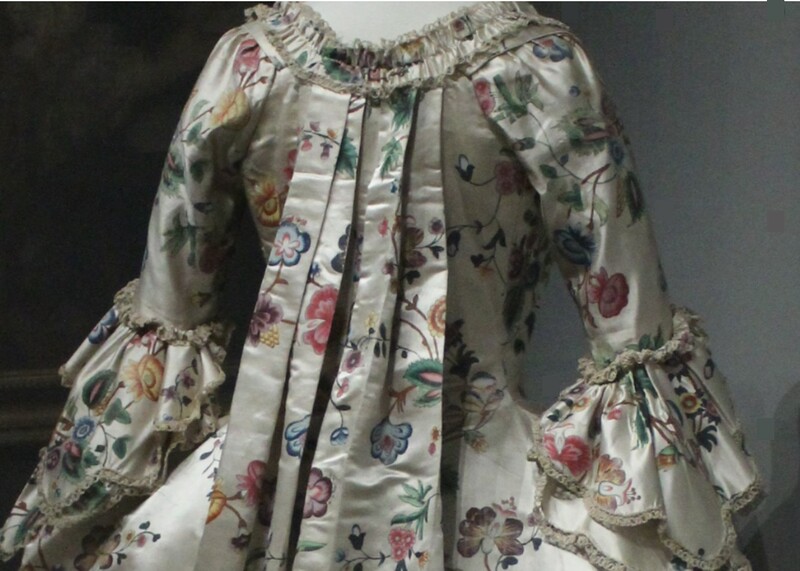 The back pleats – fixed to the robes – hung loosely from the neckline (for the robe à la française – also called a sack-back gown). It was the bodice that held the front of the gown closely to the figure. 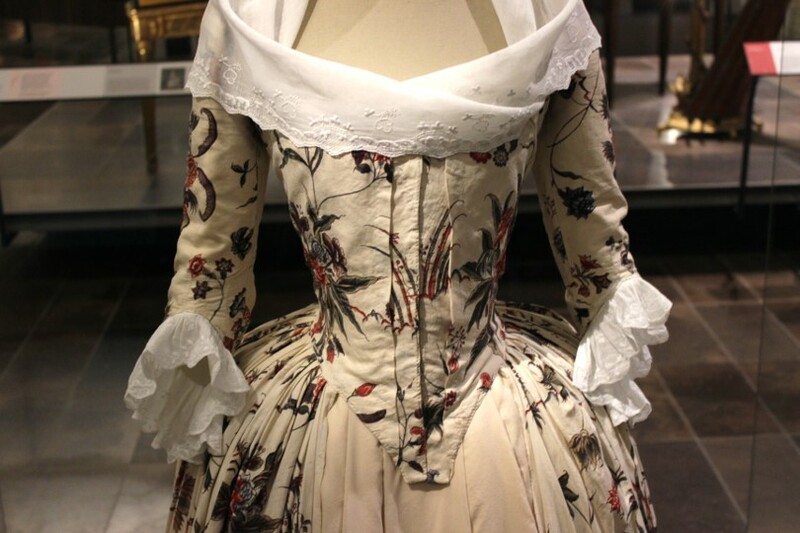 For the robe à l’anglaise, the back pleats were sewn in place to fit closely to the body. From there, they were released into the skirt. The skirt could be draped in various ways. 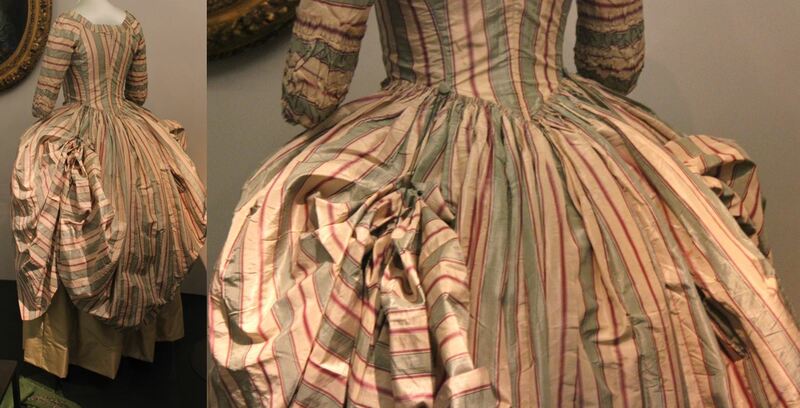 By the last quarter of the 18th century, trimmings for formal dress became very elaborate. They often costed more than the dress fabric. The neckline of the robe could be adorned with a neckerchief called a fichu (French for scarf) or, for more formal occasions, with a piece of lace. 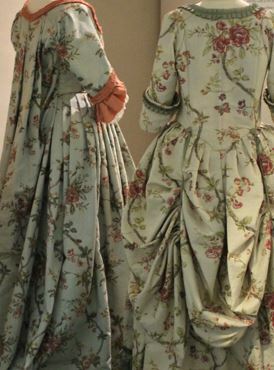 A robe à la française from around 1760 – 1770. The neckline is adorned with a fichu. 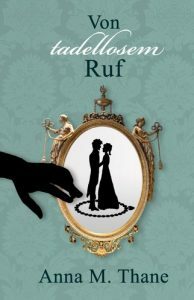 Beneath the dress was a whalebone corset. It turned the torso into an inverted triangle. The hips were visually broadened with panniers or side hoops made of reed or metal. Two sack back gowns. 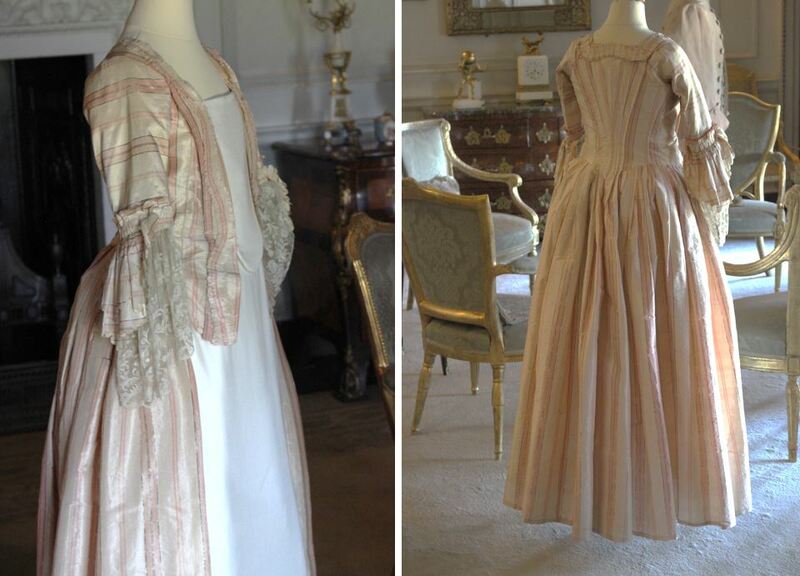 The photo (left) shows the back pleats at the back of the robe. 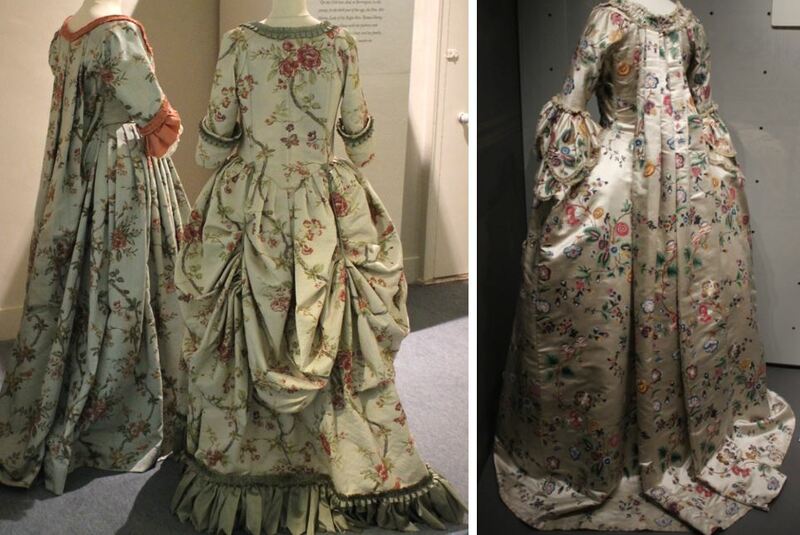 The photo (right) shows a sack back gown from the front with rich trimming. 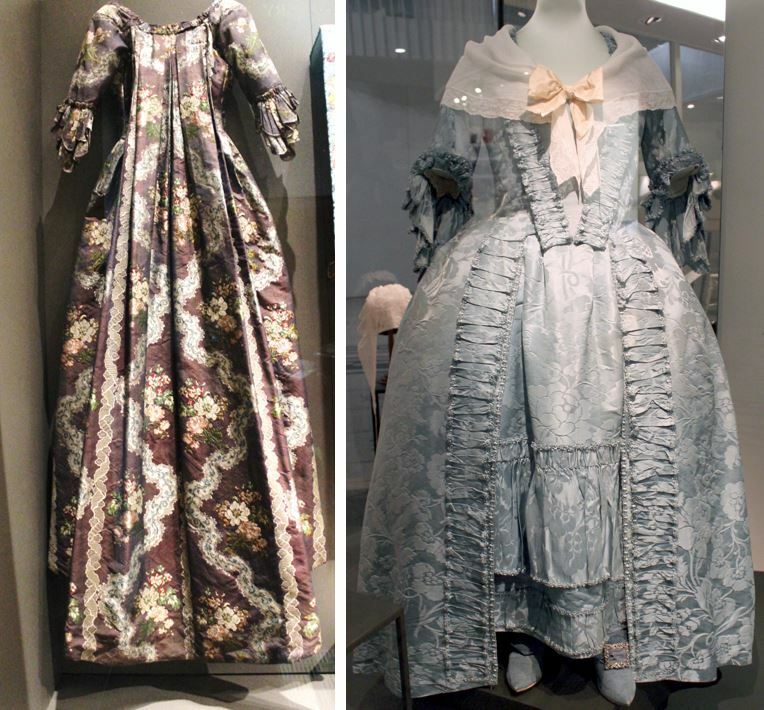 Test your knowledge: are these dresses ‘à la française’ or ‘à l’anglaise’?